Rage, Power..and Freedom – Magic of the Wildman within? | QuantumPhoenix.net – Esoterica, Paganism & Ritual Magic. Rage, Power..and Freedom – Magic of the Wildman within? Rage, Power and Freedom..! 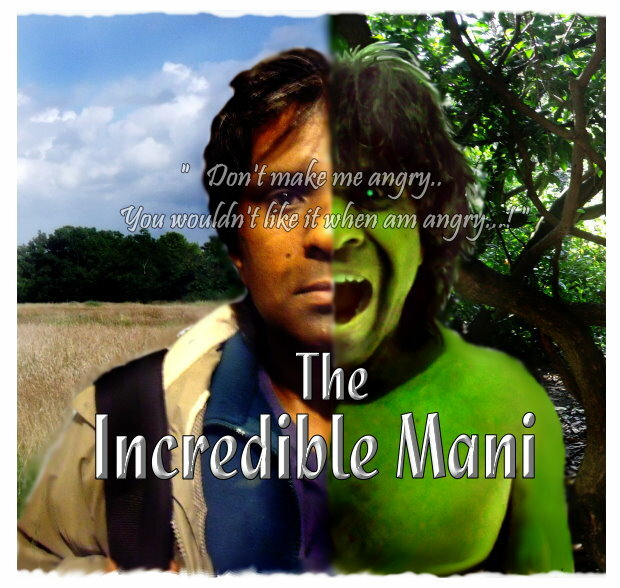 Those are qualities that the Incredible Hulk has in common with the Wildman within (applies to Wild-woman too). We are not talking about the behaviour of modern day city men and women (or even the thuggish Football hooligans) who go out in packs on an evening out, (or to a match) and act out their uninhibited self after consuming drugs or alcohol. We are (well I am) talking about the psychological functions of the Primal Man or Primal woman – the deeply buried sub-personality! (We all have an inner Wildman, inner Giant, inner Dwarf, inner wise-man/ woman, inner child and so on.. ). Hulk – as a version of Primal Man! I was watching The Incredible Hulk on Television a few nights ago (a movie that came out few years ago) – where Bruce Banner’s father talks about these qualities which his Son possesses (when he turns into the monstrous Hulk). It’s a comic book character of course – Scientist Bruce Banner accidentally gets overdosed on gamma radiation that affects his physiology for ever- and whenever Bruce gets angry or is physically violently hurt (attacked), he goes through a startling metamorphosis – and turns into a Green Giant, that seems to act on rage. It’s only when the anger subsides that the process reverses, and Bruce resurfaces .. unable to remember anything while his Hulk persona has taken over. In this case, it’s anger that’s triggering the process- and it’s anger we need to look at here! Psychologists will tell you …..Anger stems from a Self-preservation instinct.! Thankfully, unless we are getting attacked by criminals (I’ve been there many times), we don;t have to retaliate so violently. But certain things do trigger anger or rage within us. Normal anger is …well..normal. We all feel it.. at times. But rage is different. It’s all consuming, and can be violent. Am all too familiar with anger turning me into a `Hulk’ myself. Yes Anger does sometimes tear out the self-control and releases the inner-hulk. And no, I’ve never hut anyone.. but have tended to slam doors, throw household objects on the floor, and shout at anyone who’s interactions have triggered the whole process! Very close family or friends have seen this.. sadly. But it’s entirely another matter if it happens in public – usually because of some one else has been rowdy, abusive or even physically attacking me! In those moments, I have watched myself transform within- fear leaves, mind becomes alert (and assesses possible exits, safety and dangers to myself)..and of course I am ready to not just defend myself..but willing to attack in return! Anger seems to give a kind of adrenalin rush, super confidence and even strength …that can last long enough (5 -10 minutes at the most).. Where as people who are drugged r drunk may feel similar `false confidence and bravado’ and attempt to take on challenges (but their body is weak and uncoordinated by the influence of substances), a normal human being ..in a state of anger ..will have the jolt of confidence and has the normal senses that become acute and heightened.. The adrenalin fuels, and hormones flood to block any physical pain, so the person can spontaneously take on physically incredible tasks…(and more likely succeed too!). People are all too quick to catalogue a series of human emotions.. Love, hate, Joy, anger, envy, jealousy ..and a hundred more. What’s worse, anger is seen as a negative emotion to be handled, suppressed, to be shameful off, be embarrassed about.. ! We are clouded by modern day and heavily abstract thinking.. We need to go beyond.. to before…to primal times, to truly understand this. Am sure most people know enough Psychology to jump up and say, `It’s a flight or fight response’.. and they will be right too. But there’s more to it. Primal humans did not have language …not in the way we do now. Primal man didn’t have the complex cognitive understanding of a hundred emotions. In fact, am quite sure there were and still are not so many `emotions’. A large amount of it is abstract, result of our intelligence trying to give everything a label. Primal man would have felt a type of raw angry emotion, if he had been threatened or hurt. The emotions would have been also similar if something he considered his was forcefully taken from him (possession). That is unless of course he is a lowly tribesman and the one who took his possession (objects, house, cattle…or even his `mate’ ) was his Tribal Chief..in which case a sort of hierarchy comes into play (and submission!). If possible, he would attack or defend, and if not possible, he would run away to safety. This is common to any animal – then and now. And Primal man would have been no exception.. ! I haven’t read anything to known this – I merely put myself in a similar situation and remove modern day complex thoughts and system from my intellectual mind. Primal man is a few steps removed from the Ape he evolved from. And we modern people are about 10,000 years ahead of primal man! It is in moments of crisis, or personal threats – for those who are in touch with their inner Wild Man or Wildwoman- that rage becomes a trigger for transformation! We may have a hundred modern thoughts and intellectual constructs flooding our minds, but certain triggers put us right back in the realm of the Primal Man and Woman! When that trigger occurs, the inner Wildman or Wildwoman is released. Or rather, we become strongly in touch with that primal self that is burried under all those layers. And in expressing that un-civilised state, which is otherwise curtailed by our everyday systems , social stigmas, conditioning and legal framework, and in becoming unanswerable at any one or reason for a brief flashing moment…. the chains of social conditioning, expectations and all that break and fall away! And we experience personal power..and our potential for doing anything we dare… true Freedom! Some 20 years ago, long before I was a western pagan interested in doing rituals, or shamanism or any of that, and long before I ever became interested in Psychology & Counselling, I was attracted to outdoor places.. woodlands and forests.. And sometimes, when the mood has taken me, I have taken off all my cloths, put then somewhere safe, and allowed myself to be a Human-animal. While fully aware, I have enjoyed the freedom that comes from ..not walking about naked in a forest…but crawling about on the forest floor through bushes and on rocks and gravel (yes there’s been the odd scratches). I have avoided people, and allowed myself to experience a strange sense of freedom. I have crawled in the Sun and even in the storms.. and I have growled, prowled, ran, crawled and explored the world from a low point of view. And one thought has often occured (before or after those explorations). What if one day I go into the woods and never come back? What if I allow the Human animal full freedom.. and it forgets who it was? What if rationale and human intellect just peels away ..and the Human-animal that I am runs free? Yes, am sure psychologists would give it all sorts of explanations. Am aware of all that. They’d even give it all sorts of analysis and diagnosis…and I am aware of that too. Twenty years ago, I was unaware of Psychology or Spirituality, about trance, shamanism and western paganism. ..and about invoking Gods and Goddesses into Priests and Priestesses. (Now I do). The feeling of Freedom and being immersed in my power- that has been tainted by so many years of social conditioning.. But more and more, I remember those old feelings of running Wild in the Forest in thunder storms .. ! 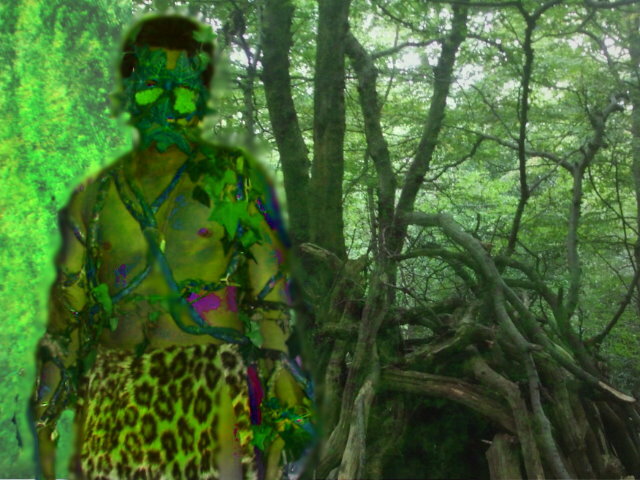 The Primal Man is still within.. and breaking at the bones to come out! Note about Hern’s Tribe: About 8 years ago, I started an outdoor shamanic ritual group called `Hern’s Tribe’ – which tends to meet 8 or more times a year alreays outdoors (rain or shine) to gather, socialise and do rituals. Tribal cultures, their systems and ways have always interested me.. for the hidden primal powers they posses. Read more about Hern’s Tribe.